Throughout my Undergraduate career, I have been an active member of the WVU Marching Band. My senior year I had the opportunity to be the Assistant Section Leader of the Trumpet Section. This allowed me to get valuable teaching experience and even some arranging experience for the sections song (Bad Blood), and some other arranging for pieces that just needed something more. In the box to the right, there are two videos. The first is of the Pride of West Virginia performing "Swing Swing Swing" where I had a solo 55 seconds in. The second video displays my arrangement of "Bad Blood" for the trumpet section which transitions to Boogie Woogie Bugle Boy (arranged by David McCoullough) with a trumpet solo performed by me. While living in Richmond, Virginia, I have spent my free time playing trumpet for many organizations. I have performed for churches in Prince George, Chester and Richmond as well as playing in musical productions at the Fort Lee Playhouse. Most recently, I have played in the musicals Annie and All Shook Up! During my time at West Virginia University I have played by myself publicly twice. Once was during my junior year in a joint recital, and the other was during my senior year where I performed a full recital by myself. These solo performances have added a lot to my idea of teaching music because preparing for a solo recital is completely different than playing in a wind band or orchestra. 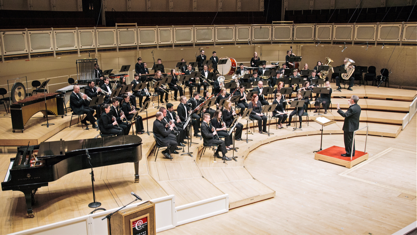 The WVU Wind Symphony during their performance in Chicago Symphony Hall. The WVU Symphony Orchestra Trumpets after the first concert of the Fall 2015 Semester. I participated in the WVU Orchestra during my Sophomore and Junior years. During that time, the orchestra was invited to play at the Collegiate Orchestra Directors Association conference at Texas Christian University during the Spring of 2014. 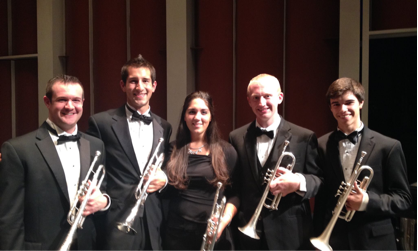 During the Fall 2014 Semester I participated in a Brass quintet named Weapons of Brass Destruction. We performed at personal recitals and in a joint quintet recital. Many classic brass quintet pieces were played and even some popular hits by groups such as Canadian Brass and The Beatles.